The Bacon & Beer Fest is being held in Boston this week and it inspired us to create our own bacon dish. 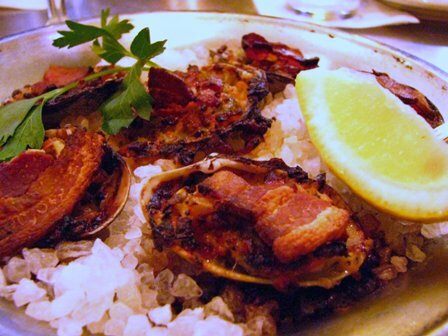 Since Gansett is the Official Beer Of The Clam we dug up the most famous clam dish with bacon. Yes we included this on the blog before, but here we include the history behind the dish. The recipe for clams casino originated right here in Rhode Island in the early 1900s at the Casino at Narragansett Pier. Here’s a great recipe for clams casino with lots of delicious bacon, clams onions, sweet peppers, garlic, herb stuffing and a dash of Gansett. Enjoy! 1-2 dozen littlenecks (count necks) or cherrystone clams; counts are about the size of a golf ball and cherrystones a little larger. Depending on the size you should get two casinos out of one clam. Unless you have shucked clams before it is not easy and dangerous if you don’t use the proper tools. A shucking knife is about the size of a paring knife but has a fatter blade and a rounded end. They can be purchased just about anywhere. You may also want to use a potholder to hold the clam because it will become a little hard on the palm of your hand. A good trick is to place the clams in the freezer for about a ½ to ¾ of an hour; when really cold they open much easier. Preheat a sauté pan to Med./high and add oil. When hot, add the chopped veggies, crab, S&P to taste and sauté until al dente. Add butter and parsley, lower heat and mix in the bread crumb mixture, some bacon bits, some clam juice and as much garlic as you like. You want the mixture moisten but not mush. Taste and correct seasonings as required, however, you probably did such a fine job it won’t need a thing. Add enough stuffing to each clam to cover the meat well and DON’T press in down like you are making meatballs. Layer it on lightly; you don’t want the tops to be smooth, you want it kind of lumpy. Top each clam off with a one inch square of raw bacon add a few drops of beer. Place under a HOT broiler as close to the heat as you can get it and cook until the all the little tips of the stuffing are browned and the bacon starts to crisp up. Serve hot with lemon wedges and Tabasco. Now picture yourself sitting on the back of your boat, it’s a beautiful day, you’re having casinos and there’s a whole case of Narragansett iced down in a cooler right next to you. In the 1840’s, people from around Rhode Island began to come to Narragansett to take advantage of its sandy beach. Narragansett’s first hotel, the Narragansett House, was built in 1856. Between 1866 and 1871, ten hotels were built transforming the Narragansett Pier from a rural agricultural port to one of America’s busiest seaside resorts. Of the many buildings constructed along the pier during this period, the most prominent was the Narragansett Casino. Designed by the New York firm of McKim, Mead and White, the same firm that designed the Rhode Island State House, the Casino was completed in 1886 and quickly became the center of life at the Pier. In its grandeur, it offered boating, billiards, bowling, tennis and other sports. It also contained stores, restaurants, a theater, a ballroom and a bandstand. In 1900, a devastating fire destroyed the original Narragansett Casino. Only the granite towers spanning Ocean Road remained. It was rebuilt in 1905 and remained on the site until 1956 when the building was once again destroyed by fire. Today, only the Towers remain. As legend would have it, Clams Casino originated in the kitchen of this Casino at Narragansett Pier in its hay day. The famous Towers still stand and you can look for that on the label of our new Summer Ale coming soon.